>If the headlines of newspapers can be a reliable indicator, then there is a lot of closed door arm wrestling between Turkey and NATO/USA. The reason for this diplomatic activity is the new missile shield NATO intents to adopt as part of the alliance’s overall mission. The originator of the ballistic missile defense system is USA. The idea evolved from Reagan administration’s Star Wars project to its current form. The missile defense system was readmitted to public discussion by George W. Bush administration. The plan devised during President G.W. Bush foresaw that 10 ballistic missile interceptors would be stationed Poland and a X-band tracking radar system would be established in Czech Republic so that these can engage any ballistic missile coming from east. It was primary a guarantee for the new NATO members of the old communist block against Russia. That plan immediately draw backfire mainly from Russia and did not gained any support from major European NATO allies. Countries like Germany, France or UK do not want to jeopardize their trade relations with Russia over ballistic missile defense system and they do no longer feel threatened by Russian nuclear weapons. The Obama administration took the Bush’s plan and brilliantly twisted in two ways. The first twist was to replace Russia with Iran as the main adversary against whom this missile shield is being established. The second twist was to change the land based sensors and weapon systems with sea based ones. The first twist is actually nothing more than a statement of the obvious. The burgeoning ballistics missile force and construction capabilities of Iran are not welcomed in USA. And it makes the whole concept of the missile shield easier to sell across the Europe where Islam-phobia is on a steady rise since September 2001. The second twist replaced the land based systems with the US Navy’s existing and combat proven AEGIS weapon system. The AEGIS equipped ships do carry the necessary sensors, C4I systems and the weapons needed to detect, track and intercept ballistic missiles on their own hulls. Plus they can be deployed anywhere on the world as long as it is accessible by sea. That is %70 of the world. The public debate that is going on in Turkey about the proposed missile shield has started too late and unfortunately the debaters have not much knowledge about the technical issues of the missile shield systems. Therefore they are discussing about political and diplomatic aspects of the proposal. Turkey’s geographical and current Turkish administration’s political proximity to Iran makes these debates inevitable. And such debates about the position of Turkey on a proposal against Iran are not limited to Turkey either. Keeping US warships in the Black Sea longer than Montreux Convention permits. 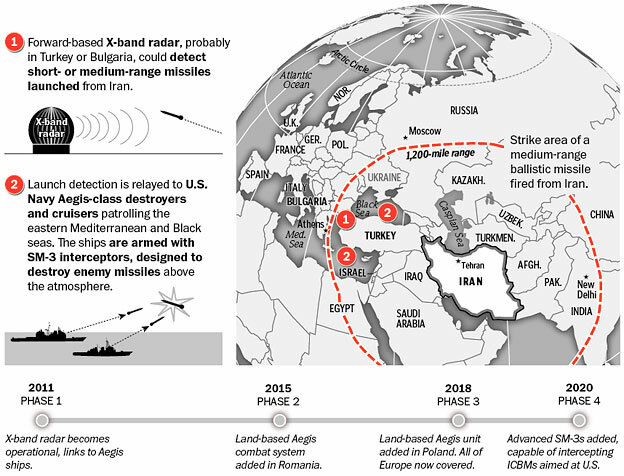 The proposed missile shield needs a tracking and detection radar close to Iranian border to provide and early warning for the system. According to analysis and studies made by US Missile Defense Agency Turkey among Georgia and Azerbaijan is one of the most obvious and suitable locations. Theoretically a radar site should not create much headache for Turkey about its relations with Iran. Turkey hosted many radar and surveillance sites for USA and NATO against Soviet Union such as Pirinçlik and Sinop. More problematic would be fielding of land based interceptors. The proposed site for these missiles is Incirlik Airbase just outside of Adana. Land based ballistic missile interceptors are needed to ensure that a seamless and total coverage against Iranian missiles is available for whole NATO territory. As they would be actual weapons to be used against among other Iran’s ballistic missiles they would create a political and diplomatic rift between Turkey and Iran. Keeping US warships in the Black Sea, longer than the Montreux Convention permits is no less unpleasing for Turkey than basing of interceptor missiles. The Montreux Convention signed in 1936, forbids warships of non-Black Sea nations, to remain in the Black Sea for more than 21 days at a time. If AEGIS equipped US warships should be stationed in Black Sea the Montreux clearly stands in the way. And any attempt to change the Montreux Convention would not only be opposed by Turkey but by Russia as well. I will write my opinion about stationing land based interceptors and AEGIS based warships in the Black Sea in detail.